• Reserved spaces $90 per space - maximum 3 per vendor. This is our primary form of communication. We do not sell nor distribute your email to third parties. Email fields are case sensitive and must match exactly to submit your application. Do you want receive informative emails from the market manager? • We do NOT sell nor distribute your email. • We do NOT send emails soliciting products. • We DO send out a spring newsletter notifying you when the application is available online. • We DO send out a newsletter/information about the final indoor market. • We periodically send out newsletters with information for vendors, but only a handful a year. • You can opt out at any time. YES - I Love the Kalispell Farmers Market and want to stay up to date! NO - I want to guess when the application goes online next year. Are you Sure You Don't Want To Receive Emails From the Market Manager? We Only Send Out a Handful a Year. I'm Sure, I can't handle 4 extra emails this year.Actually, I DO want to receive emails from the Market Manager. To be Used for Market Advertising. Please input your Facebook page address. To be used for market advertising. Please tell us your Instagram handle. Please select the category of item(s) you will be selling at the market. Please choose all fields that apply. Vendors with items that have already been approved in previous years and meet the current market guidelines are already approved and allowed to sell the APPROVED items in the market. ANY NEW PRODUCTS/ITEMS MUST BE APPROVED BY THE MARKET MANAGER. 1. All items sold must be grown and/or crafted in Flathead, Lake or Lincoln County. 3. Handcrafted items must be 75% changed from its original form. 4. Where applicable, item must conform to Federal, State and Flathead County licensing, regulations and practices. 5. Pictures are to be submitted to the Jury Committee for review prior to any vendor selling at the Market. If closer inspection is needed, vendor will be asked to provide a sample of items. Pictures are kept on file for future reference. Nothing will be juried during Market hours. 6. Original artwork produced by the vendor may be reproduced and sold. Jury committee may ask to see the originals. 7. Authors may sell copies of their original compositions. 8. Machine embroidery designs on purchased objects is not considered to be 75% changed from its original from and not handcrafted. Likewise, appliques glued to a purchased object. 9. Screen-printing of an original design on a purchased object is not considered to be 75% changed, unless a vendor does the screen-printing. 10. Processed items (bath products, soap, oils, herb mixtures, syrups, jellies, mustard) must be processed and packaged by the vendor and conform to and Health department Regulations. Ingredients must be listed on label! 11. All new items added to a vendor’s inventory, must be submitted for Jury Committee approval prior to selling at the Market. This includes any new items to be sold at the indoor Holiday Market. 12. The Jury Committee has the right to personally explore the process by which any product is made. This may need to be done before or after a vendor sells at the Market. 13. The Jury Committee reserves the right to refer applications to the Farmers’ Market Board before the vendor may sell at the Market. 14. Vendors who have sold at Market in previous years, and who now find that they are not in compliance with the selling regulations, may be granted by the Market Manager, a reasonable time to bring their products into compliance.products into compliance. 15. The Market Manager may ask the Jury Committee or ask individual Board Members to privately observe any items being sold at Market, if compliance with the above rules may be in question. 1. Vendors will be juried on creativity, WOW factor, uniqueness, variety, local sourced ingredients, originality. Menu must be submitted. Any items that you are selling need to be approved before you sell them. 2. Food must have value added. This means you have to have made it or the toppings that go on it or side dishes that go with it. You may not resell purchased items such as pop, bottled water, chips, candy etc. Only homemade items that you put some effort into making. 3. You may not give away free items. 4. You may sell iced tea/lemonade or drinks that are made and have flavors added. Ex: lemon cucumber water, mint mango water etc. 5. Your mobile cart must fit into your designated space. Maximum of three spaces allowed. 6. Food vendors are required to have a reserved space and be in the space/spaces by 8:00 a.m. NO EXCEPTIONS. 7. Food vendors must have all applicable licenses and inspections and comply with all Health Department regulations. 8. Only generators that are low noise may be used at the Market. No generators outside of your space. NOTHING can be on the grass at FVCC! Accepted file types: jpg, png, jpeg, pdf, gif, tif, tiff. IMPORTANT: SUBMIT A COPY OF YOUR APPROPRIATE COUNTY/STATE CERTIFICATIONS WITH YOUR PAYMENT AS WELL AS A COPY OF YOUR MENU IF APPLICABLE. All purchased cuttings or plugs must be in seller’s possession no less than sixty (60) days prior to date of sale. Trees, roses, ect. must be in the seller’s possession no less than ninety (90) days prior to date of sale. Verification of this, including shipping date shall be given to the market manager the first time of selling. These are to be kept on file. I will give my paperwork to the Market Manager. Remember to submit your organic certification paper work by mail with your payment. Reserved Spaces must be paid in advance of deadline to guarantee your same space(s). Fees are $90 per space, maximum of 3 spaces. NO OTHER FEES OR COMMISSIONS WILL BE COLLECTED. Vendors may park between 6:30-8:00am. Request for reserved parking after the spring or fall parking meetings will be on a first come first served basis. Fees will not be pro-rated for mid season requests. The fees are non-refundable and must be paid before you can sell. We will provide as many reserved spaces as there are requests depending on availability. We are not responsible for lost mail or untimely delivery. The price for ALL Non reserved spaces will be a flat fee of $10.00 per space, each Saturday you attend - maximum of 3 spaces. NO OTHER FEES OR COMMISSIONS WILL BE COLLECTED. Application must be received and accepted prior to selling at the market for the first time. The jury process can take up to 2 weeks for approval. Fee must be paid at the time the manager assigns your space, before parking and setup. 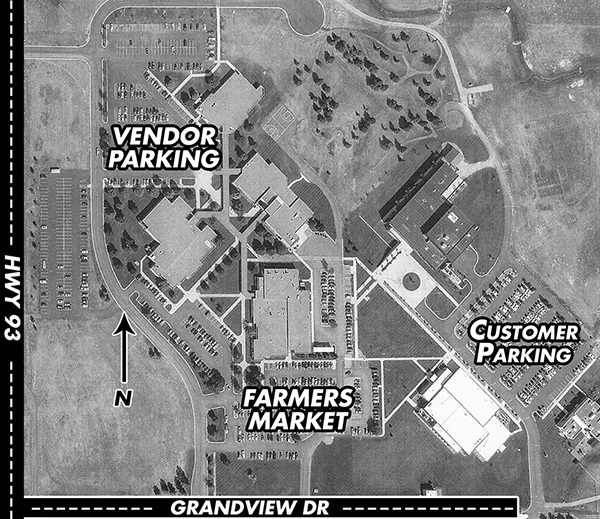 Vendors may park between 8-8:30am in the space(s) the market manager assigns. You have selected to reserve 1 space for the spring season, May 4 - July 20. Payment must be postmarked by APRIL 3rd to ensure reservation of spaces from previous seasons. Food vendors must include a copy of all applicable state/county certifications. You have selected to reserve 2 spaces for the spring season, May 4 - July 20. Food vendors remember to include a copy of all applicable state/county certifications. You have selected to reserve 3 spaces for the spring season, May 4 - July 20. Payment is Due by APRIL 3rd to ensure reservation of spaces from previous seasons. You have selected to reserve 1 space for the FALL season, July 27 - October 12. The registration fees need to be postmarked by July 1st to ensure reservation of spaces from previous seasons. You have selected to reserve 2 spaces for the FALL season, July 27 - October 12. You have selected to reserve 3 spaces for the FALL season, July 27 - October 12. The market is considering listing and featuring vendors that pay for reserved spaces on the market website. Would you like to be listed in our online directory? After clicking the submit button, if you don't receive a confirmation email, then you have not applied with us. Please check to make sure you have filled out all the required fields and try again. If you are still having problems you can contact the market manager or web admin via the CONTACT PAGE . Please take a minute to view and familiarize yourself with this map of the FVCC. After unloading, you must park your vehicle in the parking lot near the Business and Social Science Building. Confirm that you will only sell items that YOU have grown or created. I will only sell items that I have grown or created. In order to provide a fair and safe environment for all vendors and members of the public we need to confirm that you have read through and understand the Rules and Regulations. By checking this box and submitting this application I acknowledge that I have thoroughly read and understand the Kalispell Farmers Market Rules and Regulations and I agree to abide by them. All information entered on this application is true to the best of my knowledge. Yes, I will abide by the Kalispell Farmers Market Rules and Regulations. ** Upon successfully submitting your application you will automatically be sent an email confirmation to the address you provided. This should only take a few minutes. If you have not received it, please be sure to check your junk email folder. If you cannot find the confirmation then contact our market manager or our website admin.